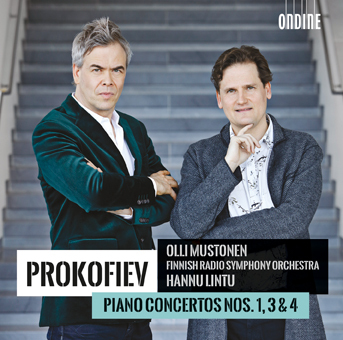 Ondine is proud to present the first disc of Sergei Prokofiev’s (1891–1953) piano concertos with pianist Olli Mustonen and the Finnish Radio Symphony Orchestra conducted by Hannu Lintu. Prokofiev’s Piano Concertos are among 20th century masterpieces. The composer himself was a skilled pianist and the works are marked with technical brilliance. The young composer made himself a major coup at the premiere of his youthful 1st Piano Concerto in 1914 and confirmed his reputation as an enfant terrible. It took several years for Prokofiev to complete his 3rd Piano Concerto – the most popular of his Piano Concertos. The work received its world premiere in Chicago in 1921 and soon the work turned into a major success also in Europe. Prokofiev’s 4th Piano Concerto (for the left hand) is slightly more austere in style and has remained in the shadow of the two other concertos included in this disc. He wrote the 4th concerto in 1931 for Paul Wittgenstein, but the work remained unperformed until 1956. Pianist Olli Mustonen has worked with most of the world’s leading orchestras, including the Berlin Philharmonic, New York Philharmonic and The Royal Concertgebouw, partnering conductors such as Ashkenazy, Barenboim, Dutoit, Eschenbach, Harnoncourt, Masur and Nagano. As a recitalist, he plays in all the significant musical capitals, including Mariinsky Theatre St Petersburg, Wigmore Hall, Beethoven-Haus Bonn, Symphony Center Chicago, New York Zankel Hall and Sydney Opera House. His many albums for Ondine include Respighi’s Concerto in modo Misolidio with Sakari Oramo and the Finnish Radio Symphony and a critically acclaimed disc of Scriabin’s solo piano music. The recent recordings by the Finnish Radio Symphony Orchestra under Hannu Lintu on Ondine have been a fruitful collaboration gathering excellent reviews in the international press.